Climate change is a global issue of common concern to the international community. In recent years, worldwide heat waves, droughts, floods and other extreme climate events have occurred frequently, making the impact of climate change increasingly prominent. It has become a main world trend that all countries join hands to respond to climate change and promote green and low-carbon development. China is the world's largest developing country, with a large population, insufficient energy resources, complex climate and fragile eco-environment. It has not yet completed the historical task of industrialization and urbanization and its development is unbalanced. China's per-capita GDP in 2010 was only a little more than RMB29,000. By the UN standard for poverty, China still has a poverty-stricken population of over 100 million, thus it faces an extremely arduous task in developing its economy, eliminating poverty and improving the people's livelihood. In the meantime, China is one of the countries most vulnerable to the adverse effects of climate change. Climate change generates many negative effects on China's economic and social development, posing a major challenge to the country's sustainable development. The Chinese government constantly sets great store by the issue of climate change and has included addressing climate change into its mid- and long-term planning for economic and social development as a major issue concerning its overall economic and social development. In 2006, China set forth the compulsive goal of reducing its per-unit GDP energy consumption in 2010 by 20 percent from that of 2005. In 2007, China became the first developing country to formulate and implement a national program to address climate change. In 2009, China put forward the goal of action to reduce the per-unit GDP greenhouse gas emission in 2020 by 40-45 percent as compared to that of 2005. 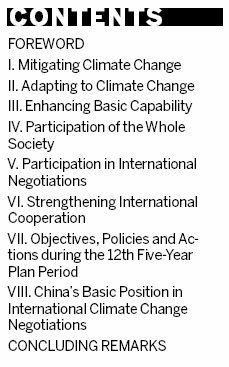 To accomplish the above goals, China adopted a range of major policy measures to mitigate and adapt to climate change during the 11th Five-Year Plan (2006-2010) period, and has achieved remarkable results. The Outline of the 12th Five-Year Plan for National Economic and Social Development released in 2011 established the policy orientation of promoting green and low-carbon development, and expressly set out the objectives and tasks of addressing climate change for the next five years. China has been playing a constructive role in international negotiations on climate change, actively pushing forward the negotiation process, thereby making a significant contribution to addressing global climate change. This white paper is hereby issued to enable the international community to fully understand China's policies and actions for addressing climate change, and the positive results achieved in this regard during the 11th Five-Year Plan period, as well as China's overall arrangements to address climate change and its related negotiating position during the 12th Five-Year Plan period. During the 11th Five-Year Plan period, China accelerated the transformation of its economic development mode, and achieved remarkable results in controlling greenhouse gas emission by promoting industrial restructuring, energy restructuring and energy conservation, improving energy efficiency, and increasing carbon sink. Reforming and upgrading traditional industries. China has formulated and released plans for restructuring and rejuvenating ten major industries, including automobiles, and iron and steel, revised the Guideline Catalogue for Industrial Restructuring, and issued the Opinions on Curbing Overcapacity and Redundant Construction in Some Industries and Guiding the Sound Development of Industries. China has raised the market entry threshold for high-energy-consuming industries, conducted energy conservation evaluation and examination of fixed asset investment projects, enhanced technology transformation and upgrading in traditional industries, promoted corporate merger and restructuring, adjusted export tax rebate policies, imposed export duties on coal, some nonferrous metals, steel billets and chemical fertilizers, and restrained the export of high-energy-consuming, high-emission and high-resource-consuming products. Efforts have been made to accelerate the pace of eliminating backward production capacity. By implementing the policy of "replacing small thermal power generating units with larger ones," China shut down small thermal power generating units with a total generating capacity of 76.82 million kw, and eliminated backward steel production capacity to the tune of 72 million tons; iron production capacity, 120 million tons; cement production capacity, 370 million tons; coke production capacity, 107 million tons; paper production capacity, 11.3 million tons; and glass production capacity, 45 million cases. The proportion of thermal power generating units with a generation capacity above 300,000 kw each in China's thermal power installed capacity increased from 47 percent in 2005 to 71 percent in 2010; the proportion of large iron production blast furnaces with an capacity above 1,000 cu m each increased from 48 percent to 61 percent; and the proportion of the output of large aluminum electrolysis prebaking tanks increased from 80 percent to above 90 percent. The industry concentration in the iron, steel, cement, nonferrous metals, machinery and automobile sectors among other key industries was remarkably improved, while energy consumption in major industries was dramatically reduced. From 2005 to 2010, coal consumption in thermal power supply dropped 10 percent from 370 to 333 g/kwh; comprehensive energy consumption per ton of steel decreased 12.8 percent from 694 to 605 kg of standard coal; that in cement production, down by 24.6 percent; that of ethylene production, down by 11.6 percent; and that of synthetic ammonia production, 14.3 percent. Fostering and strengthening strategic and newly emerging industries. China has issued the Decision on Accelerating the Fostering and Development of Strategic and Newly Emerging Industries, which defines the overall principles, key tasks and policy measures for fostering and developing strategic and newly emerging industries. The Chinese government has selected key fields of these industries, implemented a number of major projects and built a range of related programs. China has accelerated the pace of building a national innovation system, implemented knowledge- and technology-innovation projects, and intensified efforts on tackling key technological problems. The government has initiated a venture capital investment program in newly emerging industries, established 20 venture capital investment funds, and supported the growth of innovative enterprises in energy conservation, environmental protection, new energy development and other sectors in strategic new industries. In 2010, the output value of China's high-tech manufacturing industries reached RMB7.6 trillion, ranking the second in the world, and more than twice the figure for 2005. Accelerating the development of the service industry. China has formulated and implemented the Opinions Concerning Accelerating the Development of the Service Industry, Opinions on the Implementation of Some Policies and Measures for Accelerating the Development of the Service Industry, and other important documents, vigorously promoting the development of production- and life-related service trades. The government has also issued the Guidelines for Accelerating the Development of High-tech Service Industry. From 2005 to 2010, the added value of China's service sector increased 11.9 percent per year on average, with an average annual growth rate of 0.7 of a percentage point higher than that of GDP, and with its proportion in GDP rising from 40.3 percent to 43 percent. Enhancing target responsibility assessment. China has resolved and assigned responsibilities to fulfill set targets in energy conservation, and established a statistical monitoring and evaluation system to regularly evaluate the completion of energy conservation targets and the implementation of energy conservation measures by 31 provincial governments and 1,000 key enterprises. In 2010, China launched special supervision over energy conservation and emission reduction in 18 key regions. Strict target responsibility evaluation and accountability contributed to achieving the national energy conservation targets. Promoting energy conservation in key fields. The Chinese government has carried out ten key energy conservation projects, including upgrading of industrial boilers and kilns, combined heat and power generation, electromechanical system energy conservation and residual heat and pressure utilization, conducted energy conservation in 1,000 enterprises, enhanced energy conservation management of key energy-consuming enterprises, and promoted energy audit and energy efficiency benchmarking activities. It has launched the low-carbon transportation action for automobiles, ships, roads and harbors in 1,000 enterprises, vigorously developed urban public transport. It has also improved the implementation rate of mandatory energy conservation standards of new buildings, quickened the energy conservation transformation of existing buildings, promoted the use of renewable energy resources in buildings, and conducted energy conservation transformation of government office buildings. By the end of 2010, the implementation rate of mandatory energy efficiency standards for new urban buildings reached 99.5 percent in the design stage and 95.4 percent in the construction stage. During the 11th Five-Year Plan period, the accumulated total energy-efficient floor space constructed was 4.857 billion sq m, with energy-saving capacity of 46 million tons of standard coal. The government has taken energy conservation actions in the retail sector by restraining the production, marketing and use of plastic shopping bags, and curbing over-packaging. Promoting energy-saving technology and products. China has released a total of 115 state key energy-efficient technology promotion catalogues in three batches, and specially promoted seven energy-efficient technologies in the iron and steel, building material and chemical industries. The government has launched a project to promote energy-efficient products for the benefit of the people, and promoted high-efficiency illumination products and air-conditioners, energy-efficient motors and other energy-efficient products by way of government subsidies. The central treasury has appropriated subsidies to support the production of and promote the use of some 360 million high-efficiency illumination products, 30 million high-efficiency air conditioners and one million energy-efficient motor vehicles, which have realized an annual energy-saving capacity of 20 billion kwh. China has carried out energy conservation and new-energy vehicle demonstration and promotion, and taken the lead in using mixed-power vehicles, electric vehicles and fuel cell vehicles. The government has established a preferential procurement system for energy-efficient products, released a government procurement list of energy-efficient products, and ordered mandatory procurement of nine kinds of energy-efficient products, including air-conditioners, computers and illumination products. During the 11th Five-Year Plan period, a large variety of high-efficiency energy technologies were widely applied, including low-temperature waste heat power generation, new type cathode aluminum reduction cells, high-voltage frequency conversion, rare earth permanent magnet motors and plasma oil-less ignition. Meanwhile, the market share of high-efficiency illumination products reached 67 percent, and that of high-efficiency air-conditioners, 70 percent. Developing a circular economy. National "city mine" demonstration bases have been built to promote the concentrated, circular and high-added-value utilization of obsolete electromechanical equipment, waste household appliances, plastic and rubber, and other waste resources in key cities, and efforts are being made to promote the comprehensive utilization of major industrial solid waste. During the 11th Five-Year Plan period, China comprehensively utilized about one billion tons of fly ash, 1.1 billion tons of coal slag, and 500 million tons of metallurgical slag. The central government funded the industrialization of remanufacturing projects. By the end of 2010, China had formed a remanufacturing capacity of automobile engines, gearboxes, steering engines and electric generators, totaling 250,000 pieces (sets). Promoting energy conservation market mechanism. The government is proactively pushing forward energy management through contract management, power demand side management, voluntary energy conservation agreements and other market mechanisms. In 2010, China issued the Opinions on Accelerating the Implementation of Contract Energy Management and Promoting the Development of the Energy Conservation Service Industry, increased financial support, adopted policy of taxation support and improved related accounting systems and financial services to strengthen support for the energy conservation service industry. From 2005 to 2010, the number of energy conservation service companies increased from 80 to over 800, the number of employees in this sector increased from 16,000 to 180,000, the industry scale was enlarged from RMB4.7 billion-worth to RMB84 billion-worth, and the annual energy-saving capacity rose from some 600,000 to more than 13 million tons of standard coal. Improving related standards. The government has improved the energy-efficient design standards for residential buildings in three climate zones (freezing cold and cold, hot in summer and cold in winter, and hot in summer and warm in winter); improved energy-efficient design standards for public buildings and the code of acceptance inspection of energy-efficient building construction; issued 27 mandatory national standards for energy consumption quotas of high energy-consuming products and 19 mandatory national energy efficiency standards for major terminal energy-using products; formulated 15 national standards for the discharge of major pollutants; promulgated 71 environmental labeling standards; and released an energy efficiency labeling product catalogue. Incentive policies. China has quickened the reform of the energy pricing mechanism, reformed the taxes and fees of refined petroleum products, adopted a differential electricity pricing policy for high-energy-consuming industries, imposed electricity pricing penalties on products with super-high energy consumption, and promoted the metered charging of heat supply by actual consumption of each household. The government has earmarked special funds for energy conservation and emission reduction. During the 11th Five-Year Plan period, the central treasury invested an accumulative total of RMB225 billion to support energy-efficient technology upgrading and the popularization of energy-efficient products, forming an energy conservation capacity of 340 million tons of standard coal. The government meanwhile has been steadily pushing forward the reform of the resource taxation system, improving the export tax rebate system, adjusting the policy on vehicle purchase, and vehicle and vessel tax, using preferential taxation policies to promote energy and water conservation, the comprehensive utilization of resources, and the import of energy-efficient and low-carbon products. Through the efforts of all sectors, China accomplished its energy conservation goals listed in the 11th Five-Year Plan. China's energy consumption per unit of GDP dropped 19.1 percent from that of 2005 accumulatively, or a reduction of 1.46 billion tons of carbon dioxide emissions. During the same period, China's national economy expanded at an average annual rate of 11.2 percent, while its energy consumption grew only 6.6 percent annually on average. The energy consumption elasticity coefficient dropped from 1.04 in the Tenth Five-Year Plan period (2001-2005) to 0.59, which eased the contradiction between energy supply and demand. Accelerating the development of natural gas and other clean resources. The government is vigorously developing natural gas, encouraging the development and utilization of coal-bed methane, shale gas and other unconventional oil and gas resources, and has enacted a number of policies in this regard, such as financial subsidies, preferential taxation, connecting generated power to grid and electricity price subsidies. China has formulated and implemented an overall plan of management and utilization of coal mine methane, and is forcefully pushing forward the clean utilization of coal, guiding and encouraging the utilization of coal mine methane and the development of ground coal-bed methane. Natural gas production increased from 49.3 billion cu m in 2005 to 94.8 billion cu m in 2010, an average annual increase of 14 percent. In that period, China's natural gas consumption accounted for 4.3 percent of its total energy consumption, and the extraction of coal-bed methane reached 30.55 billion cu m, with the amount utilized reaching 11.45 billion cu m, equivalent to a reduction of 170 million tons of carbon dioxide emissions. Proactively developing and utilizing non-fossil energy. China has enhanced the development and utilization of hydropower, nuclear energy and other low-carbon energy sources through policy guidance and fund input. By the end of 2010, China's installed hydropower capacity had reached 213 million kw, doubling the figure for 2005; and installed nuclear power capacity had reached 10.82 million kw, with another 30.97 million kw under construction. China supports the development of wind power, solar power, geothermal, biomass energy and other new types of renewable energy. It has improved the pricing policy for on-grid power generated by wind, and launched the "Golden Sun Demonstration Project" to promote the franchise bidding for large-scale photovoltaic power stations. It has improved the pricing policy for power generated by agricultural and forestry biomass energy, increased financial support for the development of biomass energy and enhanced methane development in rural areas. China's installed wind power capacity grew from 1.26 million kw in 2005 to 31.07 million kw in 2010, and installed photovoltaic power capacity increased from less than 100,000 kw in 2005 to 600,000 kw; the number of solar water heaters in use reached 168 million sq m; and installed biomass energy capacity was about 5 million kw. With an annual utilization of methane of about 14 billion cu m, the total number of methane users in China reached 40 million households; utilized ethanol bio-fuel was 1.8 million tons; and the contribution made by all types of biomass energy totaled 15 million tons of standard coal. The government has enhanced control over greenhouse gas emission in industrial and agricultural production, waste disposal and other fields. China has applied the raw material substitution technology such as replacing limestone with carbide slag in the cement clinker production process, applied the technique of producing cement with blast furnace slag and fly ash as added mixed materials, applied secondary- and tertiary-stage treatment to address the discharge of nitrous oxide during the nitric acid production process, applied catalytic decomposition and thermal oxidative decomposition to address the discharge of nitrous oxide during the adipic acid production process, and thermal oxidative decomposition to capture and remove HFC-23. China has quickened transformation in the mode of animal husbandry production, and reduced the emission of methane and nitrous oxide in cropland, and poultry and livestock farming. The government has launched the soil organic matter advancement subsidy project, and promoted returning straw to farmland, green manure growing, adding organic fertilizer and other technologies to an accumulated total area of about 30 million mu (a Chinese unit of area equal to 1/15 of a hectare). The government has improved urban waste disposal standards, adopted a household garbage charging system, promoted advanced waste incineration technology, and formulated incentive policies for landfill gas recovery. China also carries out research and demonstration for carbon capture, utilization and sequestration technologies. Statistics showed that by the end of 2010 China's nitrous oxide emission in industrial production generally remained at the level of 2005, and the growth of methane emission was basically brought under control. Increasing forest carbon sink. China is continuously carrying out ecological protection projects, such as the key shelterbelt construction project in northwest, northeast and north China and along the Yangtze River, and projects to return farmland to forest, natural forest protection project, the program to control sandstorms in the Beijing and Tianjin area. It has carried out a pilot afforestation project with an aim to expand carbon sinks, enhanced sustainable forest management, and increased the forest stock volume. The central finance has raised the standard for afforestation investment subsidy from RMB100 to 200 per mu, and established the China Green Carbon Fund. Currently, China's man-made forest reserve has reached 62 million ha; its national forest coverage has reached 195 million ha, with the forest coverage rate rising from 18.21 percent in 2005 to 20.36 percent in 2010, with a forest stock volume of 13.721 billion cu m. China's total carbon storage in forest vegetation has reached 7.811 billion tons. Improving farmland and grassland carbon sinks. China is implementing the systems to promote grass-livestock balance, prohibiting or temporarily banning pasturing in certain areas, and regionally rotating pasturing, so as to control the livestock-carrying capacity of pastures and curb pasture degeneration. It is expanding the project of returning grazing land to grassland, strengthening the construction of man-made forage meadows and irrigated pastures, enhancing the prevention and control of grassland natural disasters, and increasing the grassland coverage rate and grassland carbon sinks. By 2010, protective farming technology had been applied to an area of 64.75 million mu; the no-tillage mechanical seeding area had reached 167 million mu; and mechanically-crushed straw had been returned to farmland in a total area of 428 million mu. Promoting low-carbon pilot projects in selected provinces and cities. In 2010, China launched a national "low-carbon province and low-carbon city" experimental project. The first batch of selected localities included five provinces, namely, Guangdong, Hubei, Liaoning, Shaanxi and Yunnan, and eight cities, namely, Tianjin, Chongqing, Hangzhou, Xiamen, Shenzhen, Guiyang, Nanchang and Baoding. Currently, all the pilot provinces and cities have established leading work teams, formulated implementation schemes, and promulgated their respective goals for carbon intensity reduction in the Twelfth Five-Year Plan period and 2020. They have also vigorously promoted the transformation of the local economic development mode, took major actions to advance the construction of key low-carbon development projects, and vigorously developed low-carbon industries to promote green and low-carbon development. Actively drawing on low-carbon development experience. To build a "culture-enriched, technology-empowered and environmentally-friendly Beijing," Beijing, the capital city of China, has accelerated the development of the green, low-carbon and circular economy, vigorously developed strategic newly emerging industries and modern service industries, quickened the low-carbon transformation of existing buildings and transport systems, and advocated low-carbon consumption and a low-carbon lifestyle. Shanghai has sped up the pace of optimizing its energy structure, launched low-carbon development pilot projects in Hongqiao CBD and Chongming Island, implemented the concept of low-carbon development in the design, construction and operation of the Shanghai World Expo Park, and carried out "voluntary emission reduction activities to achieve a low-carbon World Expo." Jiangsu Province has selected four cities, ten industrial parks and ten enterprises for pilot experiments in developing a low-carbon economy. During the 11th Five-Year Plan period, China strengthened scientific research in and impact evaluation of climate change, improved relevant laws and policies, and enhanced the capability of key sectors to adapt to climate change, so as to reduce the negative impact of climate change on economic and social development and people's lives. China strives to consolidate farmland and water conservancy infrastructure, raise the overall production capacity of agriculture, encourage large-scale construction of standard farmland with stable yields despite drought or flood, support major irrigation areas to continue building supporting and big irrigation and drainage pump stations, expand the irrigation area, improve the irrigation efficiency and spread water-conservation technology, and carry out agricultural water pricing reform and pilot water-conservation renovations of farmland ditches, and enhance the nation's capacity to resist disasters. It has built and improved agricultural meteorological monitoring and early-warning systems. China also carries out research into and cultivates stress-resistant varieties of seeds with high yield potential and high quality and resistance to drought, waterlogging, high temperature, diseases and pests, and expands the growing areas of super strains of crops. It has further increased subsidies for superior strains of crops, and accelerated integration of the cultivation, reproduction and spreading of such superior strains. Currently, more than 95 percent of the farmland nationwide is sown with superior strains of major crops, which contributes 40 percent to the grain output increase. China has formulated National Comprehensive Plan for Water Resources, Seven Major River Basins' Flood Control Plan, National Mountain Torrent Disaster Prevention and Control Plan, National Plan to Guarantee the Safe Supply of Drinking Water to Urban Dwellers, and National Plan for the Eco-protection of Major Rivers and Lakes. It has strengthened river basin management and water resources allocation, and organized and implemented the work of diverting water from the Yellow River to Tianjin and Hebei Province, from the Qiantang River to Lake Taihu at time of urgent need, and ecological water re-charge to the Heihe and Tarim rivers. It has quickened the implementation of the strictest water resources control, and improved the policy system concerning the development, utilization, conservation and protection of water resources. It has started constructing a batch of water-shed flood control projects, while accelerating the pace of some key water conservancy projects and major water resource projects. It has tightened soil erosion control, and has completed the comprehensive improvement of 230,000 sq km of land suffering from water and soil erosion. It has completed the reinforcement of large and medium-sized reservoirs as well as key small ones in danger. More efforts have been made to guarantee the safe supply of drinking water to 210 million rural residents, meeting the relevant target set in the UN Millennium Development Goals six years in advance. China has strengthened the construction of a marine meteorological observation network. With such a network in place, the country has been able to observe the key climate factors in its offshore regions and some oceans, and basically built up a typical monitoring system in the eco-sensitive marine areas, thereby effectively enhancing its ability to monitor the sea-air carbon dioxide exchange flux. China has started redefining the national and provincial marine functional zoning, has started marine ecosystem restoration projects in the coastal areas and on key islands, and launched eco-restoration demonstration projects such as cultivating and replanting mangroves, protecting coral reefs by way of relocation, and returning coastal wetlands to beaches. The observation and early warning work related to storm surge, sea wave, tsunami, sea ice and other marine disasters have effectively reduced the casualties and property losses caused by such marine disasters. Observation, investigation and evaluation have been conducted of sea level rise, coastal erosion, seawater intrusion and saline tide, and the datum tide marks of 94 tidal gauging stations have been re-verified. Through comprehensive offshore investigation and evaluation, it has obtained systematic knowledge of the distribution, both spatially and temporally, of marine disasters. In addition, annual gazettes have been released on marine conditions, sea levels and marine disasters to provide information for preventing and combating various marine disasters. China has worked out and promulgated the National Health Emergency Response Plan against Natural Disasters (Trial) which has clearly defined the health-related goals and principles in case of floods and droughts, meteorological and biological disasters, and other natural disasters, established the natural disaster emergency response work system, the levels and measures of such response, and formulated emergency response work plans against different types of natural disasters. The Emergency Response Plan against High-temperature Heat-stroke (Trial) and National Environment and Health Action Plan (2007-2015) have also been enacted. Researches have been carried out in the monitoring of the quality of drinking water, the impact of air pollution on health, infectious diseases caused by climatic factors, the impacts of climate change on vector-borne parasitic diseases and water-borne communicable diseases, and other diseases caused by impacts of climate change on environment, so as to provide technical support for the formulation of policies and measures to adapt to climate change. The meteorological departments have released and implemented the Weather Research Plan (2009-2014), Climate Research Plan (2009-2014), Applied Meteorology Research Plan (2009-2014) and Comprehensive Meteorological Observation Research Plan (2009-2014), and distributed the China Implementation Plan of the Climate Observation Systems, in an effort to promote the observation, pre-evaluation and evaluation of climate change. China has set up the first-generation operational system based on a dynamical climate model for short-term climate prediction, developed the new-generation dynamical climate model system, and conducted various evaluations regarding the impact of climate change on the safety of national grain supply, water supply, ecology and human health. To build up its basic capability in this regard, during the 11th Five-Year Plan period China continued to improve relevant legislation, management system and working mechanism for addressing concerning climate change, strengthened statistical and calculation research and institutional construction, raised the level of scientific research and policy study, and further strengthened relevant education and training. Improving relevant laws and regulations. China has formulated or amended the Renewable Energy Law, Circular Economy Promotion Law, Energy Conservation Law, Clean Production Promotion Law, Water and Soil Conservation Law and Islands Protection Law, promulgated the Regulations on Civil Buildings Energy Conservation, Regulations on Public Organizations Energy Conservation and Regulations on Drought Control, and issued the Interim Measures for Energy Conservation Evaluation and Review of Fixed Assets Investment, Measures for Energy Conservation Supervision of High-Energy-Consuming Special Equipment and Interim Measures for Supervision of Energy Conservation and Emission Reduction of National Enterprises. It has also conducted pre-legislation study on climate change. Formulating and implementing China's National Climate Change Program. This Program defines the guiding principles, main fields and key tasks concerning the work of addressing climate change. As required by this document, 31 provinces, autonomous regions and municipalities directly under the central government have all worked out their own programs to address climate change, and have put them into practice. The work to address climate change has been gradually incorporated into the plans of economic and social development of each locality, and placed on the priority agendas of local governments. Relevant departments have also worked out action plans and working programs in such fields as marine resources, meteorology and environmental protection. Promulgating a series of important policy documents. China has promulgated the Mid- and Long-term Plan for the Development of Renewable Energy, Mid- and Long-term Plan for the Development of Nuclear Energy, the 11th Five-Year Plan for Renewable Energy Development, Decision on Energy Conservation Work, Opinions on Accelerating the Development of Circular Economy and other important documents. The Comprehensive Working Plan for Energy Conservation and Emission Reduction in the 11th Five-Year Plan Period, released in 2007, stated the goals, key fields, and policy measures regarding energy conservation and emission reduction, and played a significant role in promoting energy conservation and emission reduction work in the period 2006-2010. China has built and constantly improved its management system and working mechanism to address climate change, which features the unified leadership of the National Leading Group to Address Climate Change, administration by the National Development and Reform Commission (NDRC), division of work with separate responsibilities among relevant departments and wide participation of various localities and industries. In 2007, the National Leading Group to Address Climate Change was set up, with premier of the State Council as its head and 20 ministers as its members. The NDRC was assigned the specific work by the leading group, and in 2008 the NDRC set up a department to coordinate and supervise the relevant work. Following that, relevant government departments established functional organs and working mechanisms to address climate change work in their own fields. To coordinate the inter-ministry work, a liaison office was set up within the framework of the National Leading Group to Address Climate Change in 2010, and the National Panel on Climate Change was adjusted and strengthened to ensure scientific decision-making. All provinces, autonomous regions and municipalities directly under the central government have established their own leading groups and working organs to address climate change, and some sub-provincial or prefectural cities have also set up offices to address climate change. Relevant departments under the State Council have founded supportive organs such as the National Center for Climate Strategy and International Cooperation of China, and the Research Center for Climate Change, and some universities and scientific institutions have opened their own climate change research organizations. Improving energy and related statistical systems. China has issued the Implementation Plan and Methods for Statistical Monitoring and Reviewing of Energy Conservation and Emission Reduction, further improved the energy-consumption accounting calculation system, and worked out ten new energy statistical systems, which basically cover energy consumption by all sectors of society. The various localities have improved their energy statistical setups and personnel placement to spur statistical work in this field. All provinces, autonomous regions and municipalities directly under the central government have set up energy statistics organizations, and key energy consumption units have boosted their energy statistical and accounting work. A reporting system has been in place for key energy consumption units to report their energy utilization, and standardize their submission of such reports. Technical guidance for forest carbon sink metering and monitoring has been formulated to promote the construction of such metering and monitoring systems. Reinforcing greenhouse gas emission accounting. In the wake of its submission of the Initial National Communication on Climate Change of the People's Republic of China to United Nations Framework Convention on Climate Change (UNFCCC) at the tenth session of the Conference of the Parties in 2004, China organized the compilation of a greenhouse gas emission list and the second national communication report in 2005. It has built a national databank of greenhouse gas lists, issued the Guidance for Compiling Provincial Greenhouse Gas Emission Lists (Trial), and started the compilation work at provincial level and held a series of training courses in this regard. Augmenting fundamental research. China has compiled its first and second National Evaluation Reports on Climate Change. It has conducted research into the relations between climatic change and environment quality, coordinated control of greenhouse gas and pollutants, climate change and the water cycle mechanism, and climate change and forestry response measures. It has built a data set on climate change trend, and released a data set on Asian climate change prediction. It has opened several special laboratories in sea-air interaction and climate change, and has conducted large amounts of work in fundamental research. Promoting climate-friendly technological R&D. With the support of the National Hi-tech R&D Program ("863 Program") and the National Key Technologies R&D Program, China has started R&D into clean and efficient utilization of energies, energy-saving technology and equipment in certain key industries, key energy-saving technology and materials for buildings, key technology and equipment of clean production for key industries, and pattern of a low-carbon economic development and integrated application of key technologies, and has made significant progress with a number of invention patents of its own intellectual property rights. China also pushes forward the R&D of technology for the development and application of renewable and new energies, and key technology for the smart grids. It has made evaluations of the practice of using greenhouse gas as a resource to enhance the petroleum recovery ratio, and of the capacity of underground storage and storage of carbon dioxide in underground saline water, and has carried out R&D in the preparation and sifting of new, safe and efficient absorption materials. Included in the National Key Technologies R&D Program through the 11th Five-Year Plan are special programs to study the impacts caused by and adaption to climate change and corresponding key technologies to address them, and to demonstrate the technologies used to adapt to climate change in typical fragile zones. In terms of carbon emission monitoring, China has begun its research in Orbiting Carbon Observatory. With the support of the "863 Program" and the National Key Technologies R&D Program, China has started to research in and demonstrate carbon capture and emission reduction technologies applied in major agricultural and forestry ecosystems, and key technologies in forestry eco-construction, and research into the technologies for monitoring, early warning and addressing major agriculture-related climatic disasters. It has carried out evaluations and applied research into technologies of energy conservation and emission reduction for key industries, which is a project of the National Key Technologies R&D Program. By 2010, the country had built 288 state engineering research (technological) centers and 91 state engineering laboratories. Strengthening strategy and policy study. Centering on the major tasks in addressing climate change during the 12th Five-Year Plan period, China is studying a long-term strategy to cope with the issue of climate change, a strategy of low-carbon development, and a national overall strategy to address climate change and carbon trading mechanism, as well as relevant laws and regulations at home and abroad related to climate change. It has started a special scientific action, with a total investment of 110 million yuan, to deal with climate change, and begun studying major strategies and technical issues to promote its own green development. Gradually including climate change into the national education system. Education on environmental protection and climate change has been given more attention in secondary schools and universities, and relevant courses, teaching and research bases have been set up. All these have played an important role in fostering professionals in this regard. More training on climate change for officials. Collective studies, lectures and reports have been organized to help officials enhance their awareness of climate change and scientific management. The training classes organized by relevant departments under the central government cover such subjects as climate change, sustainable development and environmental management, capability building of provincial decision-makers in charge of climate change work, capability building of local officials in charge of clean development mechanism, climate-change-adaptation capability building, and capability building of provincial greenhouse gas lists compilation. Local governments have also organized various training courses on climate change. China proactively publicizes relevant scientific knowledge in addressing climate change, enhances public awareness of low-carbon development, gives full play to the initiatives of non-governmental organizations, the media and other outlets, and uses various channels and measures to guide the whole society to participate in actions addressing climate change. Since 2008, China has published an annual report titled "China's Policies and Actions for Addressing Climate Change" to give comprehensive introductions to China's policies and progress in addressing climate change. It organizes an "energy-saving publicity week" every year to publicize knowledge of energy conservation and emission reduction, and knowledge of climate change among the people. It also proactively popularizes the scientific knowledge of climate change on World Environment Day, World Meteorological Day, the Earth Day, World Oceans Day, World Car-free Day, National Day of Disaster Prevention and Reduction, National Day of Science Popularization and other theme days. The local governments of Beijing, Tianjin, Guiyang and other cities have held large international seminars, forums and exhibitions on climate change, energy conservation and environmental protection to enhance exchanges on low-carbon development with other countries and public awareness on addressing climate change, energy conservation and low-carbon development. The government also has given full play to the roles of newspapers, radio, television, magazines and other traditional media as well as the Internet, mobile phones and other new media to strengthen publicity and education on addressing climate change, energy conservation and low-carbon development. The China Society of Territorial Economics has opened low-carbon territory experimental areas, the All-China Environment Federation and China Tourism Association have carried out the nation's first low-carbon tourism experiments at 48 tourist resorts, and the China Iron and Steel Industry Association and All-China Federation of Trade Unions have organized benchmarking contests on energy conservation and consumption of large-scale energy-consuming steel production equipment. The China Energy Conservation Association and other organizations have held summit media forums on climate change and low-carbon economic development. The China National Coal Association, China Nonferrous Metals Association, China Petroleum and Chemical Industry Association, China Building Materials Federation, China Electricity Council and other organizations have also played important roles in the planning of industry energy conservation, formulation and implementation of energy conservation standards, promotion of energy conservation technology, energy consumption statistics, and energy conservation publicity and training, information and inquiry, and related areas. Some non-profit organizations have also held publicity and education campaigns to boost public awareness on addressing climate change. The Chinese media organs constantly strengthen publicity and news coverage on climate change, energy conservation and low-carbon development. The media have compiled and published a series of introductory and publicity picture books on climate change and the prevention of meteorological disasters, produced films and TV series, including Facing Climate Change, Warming Earth, Focusing on Climate Change, and Same Hot, Same Cool, the World Over, actively introducing China's policies, actions and achievements in addressing climate change, advocating a low-carbon lifestyle, increasing the public's knowledge and understanding of climate change and presenting China's efforts and achievements in combating climate change. The Chinese public proactively responds to climate change with action: taking their own shopping bags, using both sides of paper, limiting the temperature of air-conditioners, refusing to use disposable chopsticks, purchasing energy-saving products, choosing low-carbon means of transport, preferring low-carbon food, leading low-carbon lifestyles and practicing low-carbon life and consumption in every aspect of daily life, including clothing, food, residence and travel. People all around China actively participate in the Earth Hour program and turn off their lights on the last Saturday of March each year to express their mutual aspiration for the protection of the global climate. The 1,000-youth environment-friendly ambassador program and other activities are held to publicize the concept of environmental protection, advocate a low-carbon lifestyle and practice green consumption at state organs, schools, communities, barracks, enterprises, parks and public squares. In some big and medium-sized cities, a low-carbon life has become a trend sought after by people who pursue a simple and low-carbon lifestyle. Shanghai, Chongqing, Tianjin and other cities have carried out the "Cool China National Low-carbon Action" to survey and analyze family carbon emissions. Harbin and other cities have initiated energy-saving and emission-reduction programs in communities, mobilizing families, schools, businesses and services, and state organs in communities to take part in energy conservation and emission reduction. Universities, high schools and primary schools all around the country have actively publicized the low-carbon lifestyle and environmental protection, and the goal of building a "green campus" set by some universities has aroused wide-spread attention. The Chinese government attaches great importance to the issue of global climate change. With a high sense of responsibility, it has proactively and constructively participated in international negotiations to address climate change, strengthened multi-level negotiations and dialogues with other countries in the area of climate change, striving to promote consensus among all parties on the issue of climate change and make positive contributions to building a fair and reasonable international mechanism for addressing climate change. China adheres to the double-track negotiation mechanism defined in the UNFCCC and the Kyoto Protocol, abides by the principles of signatory leadership, openness and transparency, extensive participation and consensus through consultations, gives active play to the main channel of international climate change negotiations within the UN framework, sticks to the principle of "common but differentiated responsibility," proactively and constructively participates in negotiations, strengthens communication and exchanges with various parties, and promotes consensus among all parties. In 2007, China proactively and constructively attended the United Nations climate change talks in Bali, Indonesia, and made a substantial contribution to the development of the Bali Road Map. China's three suggestions at the talks including that the emission-reduction goals of developed countries shall be negotiated and decided before the end of 2009 at the latest, that fund and technology transfer for developing nations be provided as stipulated in the UNFCCC and Kyoto Protocol, and other advice received extensive acknowledgement, and were finally adopted and included in the road map. In 2009, China proactively participated in the Copenhagen Climate Change Conference, and played a key role in breaking the negotiation deadlock and promoting consensus among all parties. The Chinese government delivered a statement titled "Implementation of the Bali Road Map China's Position at the Copenhagen Climate Change Conference," in which the Chinese government put forward China's principles, goals and position on the conference, including further strengthening the comprehensive, effective and continuous implementation of the UNFCCC and quantifying emission-reduction targets for developed countries for the second commitment period. At the meeting of state leaders, Chinese Premier Wen Jiabao called on all parties to reach a consensus, strengthen cooperation and jointly promote global cooperation to address the climate change problem. During the conference, Premier Wen had intensive consultations with various state leaders, and promoted the adoption of the Copenhagen Accord, making outstanding contributions to the promotion of international talks on climate change. In 2010, China took an active part in the negotiations and consultations at the Cancun Conference, adhered to the principles of maintaining openness and transparency, extensive participation and consensus through consultations, proposed constructive plans on various issues and made important contributions to help the conference achieve practical results and put the talks back on track. During the negotiations on issues with greater disparity in particular, such as the long-term global goal, the second commitment period of the Kyoto Protocol, the system of "international consultation and analysis" to reduce the burden on developing countries and reach the emission-reduction goals of developed countries, China actively communicated and coordinated with the engaged parties, candidly exchanged in-depth opinions with all parties at all levels, enhanced mutual understanding and converged political impetus. Before the Cancun Conference was summoned, China enhanced exchanges and coordination with developing countries through the "G77 and China" and the "BASIC" (Brazil, South Africa, India and China) mechanisms, and strengthened dialogue with developed countries through various channels for the preparation of the conference. China also maintained close communication and exchanges with the host nation, Mexico, and provided beneficial suggestions and full support. In October 2010, prior to the opening of the Cancun Conference, China hosted a UN climate change meeting in Tianjin, which laid the basis for the Cancun Conference to achieve positive results. Promoting negotiations with exchanges of high-level visits and important meetings. At the G20 Summit, dialogue meetings of state leaders of the G8 and developing countries, Major Economies Meeting on Energy Safety and Climate Change, APEC meetings and other important multi-lateral diplomatic occasions, Chinese President Hu Jintao made important speeches to promote consensus in the international community to address the climate change issue, and jointly promote global cooperation to address the climate change process. On September 22, 2009, President Hu attended the United Nations Summit on Climate Change, and delivered a speech titled "Join Hands to Address Climate Change," in which he set forth China's goals, position and opinions on addressing climate change, and expressed China's wish for strengthening international cooperation. At the East Asia Summit, EU-China Business Summit, Asia-Europe Meeting and other important international conferences, Chinese Premier Wen Jiabao repeatedly stated China's position and actions adopted on issues including the deepening of international cooperation and exchanges to address climate change and the development of a green economy, calling for further international cooperation on climate change technology and management, and deepening mutual understanding among the involved parties. Proactively participating in relevant international processes on climate change talks. China took part in the informal ministerial-level consultation meeting held by the host nation of the UN Climate Change Conference, the energy and climate forum of major economy leaders, the ministerial-level dialogue meeting on climate change in Petersburg, the ministerial-level meeting on climate change of small island states, the ministerial-level dialogue meeting of climate technology mechanism, the high-level consultation team meeting on climate change financing of the general secretary of the UN, meetings of the International Civil Aviation Organization, the International Maritime Organization and the Global Agricultural Greenhouse Gas Research Alliance, and many other international consultation and exchanges. China proactively participated in the activities of the Intergovernmental Panel on Climate Change and its working groups, and Chinese scientists took part in the drafting of each assessment report. Strengthening consultation and dialogue with various countries. China is strengthening ministerial-level consultation with the United States, the European Union, Denmark, Japan and other developed countries and regions; and enhancing communication with other developing countries, promoting the establishment of a consultation mechanism among the BASIC countries, and coordinating and promoting the process of climate change talks by adopting the "BASIC plus" framework. It is also beefing up communication with the African countries, the least-developed nations and small island states. The China National Panel on Climate Change actively holds academic exchanges and dialogues with relevant think tanks of other nations to promote international cooperation in the scientific research in climate change, technology transfer, public education, information sharing and other areas. China proactively participates in and promotes practical cooperation with governments, international organizations and institutions based on the principles of "mutual benefit and win-win cooperation, being practical and effective," and is playing a positive and constructive role in promoting cooperation of the global community in addressing climate change. In March 2010, China issued the Interim Measures on the Administration of External Cooperation to Address Climate Change, which further standardized and promoted international cooperation on climate change. China strengthens communication and exchanges, resource sharing and practical cooperation with relevant international organizations and institutions, and has signed a series of cooperative research agreements and implemented a batch of research projects on the scientific study, mitigation, adaptation, policies and measures to respond to climate change, including project cooperation with the United Nations Development Program, World Bank and European Investment Bank; carbon capture, utilization and sequestration cooperation with the Asian Development Bank, Carbon Sequestration Leadership Forum and Global Carbon Capture and Sequestration Research Institute; cooperation on the assessment of China's technological needs with the Global Environment Facility; and cooperation with the Energy Foundation on the greenhouse gas inventory preparation capability, research into related policies and technical road maps, and legislation concerning climate change. China proactively joins relevant international scientific cooperation programs, such as the World Climate Research Program within the framework of the Earth System Science Partnership, International Geosphere-Biosphere Program, International Human Dimensions Program, Intergovernmental Group on Earth Observation Satellites, Global Climate Observation System and other programs, and the results of relevant researches have provided a useful reference to China in formulating its policies to address climate change. China has established a dialogue and cooperation mechanism on climate change with the United States, European Union, Italy, Germany, Norway, Britain, France, Australia, Canada, Japan and other countries and regions, and has signed relevant joint communiques, memorandums of understanding and cooperation agreements with climate change as the focus of cooperation. China has promoted cooperation on energy conservation and environmental protection with Japan; carried out joint research on the three prioritized areas of building energy conservation, clean coal/carbon capture and sequestration, and clean energy automobiles with the United States; boosted scientific cooperation on electric vehicles with Germany; and pursued cooperation on the geological sequestration of carbon dioxide with Australia, cooperation on clean energy/carbon capture and sequestration technology with Italy, cooperation on building energy conservation and quality with the European Union, cooperation on green buildings and ecological urban development with Britain, cooperation on the adoption of modern wooden structures to address climate change with Canada, and cooperation on urban and rural sustainable development with Sweden. China has signed relevant joint communiques, memorandums of understanding and cooperation agreements with South Africa, India, Brazil, Republic of Korea and other countries, established a cooperation mechanism on climate change, strengthened cooperation on meteorological satellite monitoring, new energy development and utilization and other areas, and aided the construction of 200 clean energy and environmental protection projects in developing countries. China is strengthening its cooperation on science and technology, and has implemented 100 China-Africa joint scientific and technical research demonstration projects. It also bolsters agricultural cooperation and aids the construction of agricultural demonstration centers. It has dispatched agricultural technical experts, trained agricultural technical personnel and improved Africa's ability to realize food security. It attaches importance to cooperation in human resource development, and has carried out 85 foreign aid training programs. China held a training session on clean development mechanism and renewable energy resources in Djibouti in December 2008; held a seminar on addressing climate change for officials of developing countries in Beijing in June 2009; opened an advanced seminar on climate and climate change in developing countries for officials and scholars from African nations in Beijing in July the same year; and arranged a total of 19 international seminars addressing climate change and clean energy in 2010, which offered training to 548 officials and professionals of the recipient countries. China has also offered support and assistance to small island states in the South Pacific, the Caribbean and other regions, and aided the construction of over 130 projects in the island countries of the Pacific, providing assistance within its ability to developing countries to improve their capability to mitigate and adapt to climate change. In order to promote the orderly implementation of clean development mechanism (CDM) projects, China formulated and promulgated the Measures on the Operation and Management of Clean Development Mechanism Projects in 2005, which was amended in 2010 to increase the efficiency of CDM program development and validation and verification. China vigorously carries out relevant capacity building to improve its capacity to promote CDM project development, and organizes experts to calculate baseline emission factors for power grids each year which are timely published and shared by others. By July 2011, China had approved 3,154 CDM projects, mainly focusing on new energy and renewable energy, energy conservation and the enhancement of energy efficiency, methane recycling and reutilization and other areas. A total of 1,560 Chinese projects have been successfully registered with the United Nations Clean Development Mechanism Executive Board, accounting for 45.67 percent of the world's total registered programs, and their estimated certified emission reduction (CER) has reached an annual issuance volume of 328 million tons of carbon dioxide equivalent, accounting for 63.84 percent of the world's total, providing valuable support for the implementation of the Kyoto Protocol. During the 12th Five-Year Plan period, China will take addressing global climate change as an important task in its economic and social development. With scientific development as the theme and accelerating the transformation of the country's economic development pattern as the main focus, China will foster the concept of green and low-carbon development, and take addressing climate change as an important strategy for its economic and social development as well as an important opportunity for economic restructuring and the transformation of its economic development pattern. It will adhere to the new road of industrialization, rationally control total energy consumption, take various measures such as comprehensively optimizing the industrial structure and energy mix, practicing energy conservation and raising energy efficiency, and increasing the capacity of carbon sinks to effectively control greenhouse gas emissions, improve the capacity to cope with climate change, conduct extensive international cooperation on climate change, and promote sustainable economic and social development. Before the Copenhagen Climate Change Conference was held in 2009, the Chinese government had announced the objective of reducing greenhouse gas emissions per-unit GDP by 40-45 percent by 2020 as compared with that in 2005, and had it included as a compulsory indicator in its medium- and long-term program for national economic and social development. In March 2011, the Outline of the 12th Five-Year Plan for National Economic and Social Development of the People's Republic of China adopted by the National People's Congress stated the following compulsive objectives to address climate change during the 12th Five-Year Plan period: By 2015, carbon dioxide emission per-unit GDP would be reduced by 17 percent and energy consumption per-unit GDP by 16 percent as compared with that in 2010; the proportion of consumption of non-fossil energy to the consumption of primary energy would be increased to 11.4 percent; and the acreage of new forests would increase by 12.5 million ha, with the forest coverage rate raised to 21.66 percent and the forest growing stock increased by 600 million cu m. This fully demonstrates Chinese government's determination to promote low-carbon development and address climate change. First, strengthening the legal system building and strategic planning. In accordance with the requirements set in the Resolution of the Standing Committee of the National People's Congress on Making Active Responses to Climate Change, China will study and enact special laws in addressing climate change, and revise relevant laws, regulations, rules and standards in line with the requirements of the work on climate change. China will also conduct research in low-carbon development strategy and study of the overall strategy to adapt to climate change, put forward China's road map for technological development to respond to climate change and control greenhouse gas emission, and compile the National Plan to Address Climate Change (2011-2020) to guide the work in the coming ten years. Second, accelerating economic restructuring. Through policy readjustment and institutional innovation, China will promote industrial upgrading and optimization, and accelerate the transformation of the economic development pattern. It will limit the excessively rapid expansion of energy-hungry and high-emission industries, accelerate the pace of eliminating backward production capacity, vigorously develop modern services, foster newly emerging industries with strategic significance, and speed up R&D of low-carbon technology and product promotion, with a view to gradually establishing energy, industry, transportation and construction systems featuring low-carbon development. Third, optimizing energy mix and developing clean energy. China will rationally control its total energy consumption, formulate energy development plans, and define the total consumption control target and the mechanism to share out the tasks and responsibilities. It will accelerate the development of clean coal technology, push forward the production and use of clean coal, promote the rapid growth of natural gas output, speed up the development and utilization of such unconventional oil-gas resources as coal-bed gas and shale gas, safely and efficiently develop nuclear energy, and accelerate the development of renewable water, wind, solar, geothermal and biomass energy in accordance with local conditions. Fourth, continuing to implement key energy-conservation projects. China will carry out various energy-conservation renovations, including the remodeling of boiler and kiln systems, motor system energy saving, energy system optimization, utilization of residual heat and pressure, economical use and substitution of oil, energy conservation in buildings and green lighting. It will also carry out key energy-conservation projects such as demonstration projects in the industrialization of energy-saving technology, energy-saving product promotion, popularization of energy performance contracting and energy-saving capacity building, promote energy conservation in the key fields and sectors of industry, construction and transport, and endeavor to raise overall energy efficiency. Fifth, vigorously developing a circular economy. China will continue to coordinate low-carbon development strategies, and other resources- and environment-related policies, support technological R&D, demonstration and popularization, and capacity building for the development of a circular economy, and make efforts to increase the productivity of resources. China will compile an overall national circular economic development plan, intensify demonstration pilot projects, speed up the establishment of an evaluation index and statistical systems that can reflect the development of the circular economy, and make key enterprises, industrial parks and cities ecology friendly through application of recycling technologies and the market mechanism. Sixth, steadily launching low-carbon pilot projects. China will organize provinces, autonomous regions and municipalities chosen to undertake pilot projects to compile low-carbon development plans, actively explore low-carbon development modes with local characteristics, take the lead in formulating policies, systems and mechanisms conducive to low-carbon development, and speed up the establishment of industrial systems and consumption patterns characterized by low-carbon development. China will also organize low-carbon pilot projects in industrial parks, communities and commerce. Seventh, gradually establishing a carbon emissions trading market. China will, drawing on the experience of the international carbon emissions trading market while taking into consideration its actual conditions, gradually promote the establishment of a carbon emissions trading market. The country will further reform the price formation mechanism of carbon emissions trading by standardizing voluntary trading in emission reduction and discharge rights, gradually establish trans-provincial and trans-regional emissions trading systems, so as to give full play to the fundamental role of the market mechanism in optimizing the allocation of resources, and realize the objective of controlling greenhouse gas emission at minimum cost. Eighth, enhancing the capacity of carbon sinks. China will vigorously promote afforestation, continue to carry out ecological protection projects, such as the key shelterbelt construction project in Northwest, Northeast and North China and along the Yangtze River, and projects to return farmland to forest, natural forest conservation project, the program to control sandstorms in the Beijing and Tianjin area, and the comprehensive treatment program of rocky desertification in the karst areas. China will also make extensive efforts to promote afforestation in the urban areas and speed up the building of forest eco-barriers for the cities. At the same time, it will conduct pilot projects in carbon sink afforestation and promote the healthy and orderly development of forest carbon sinks. It will continue to carry out projects such as protective farming and turning grazing area back to grassland, and increase the areas of farmland and grassland carbon sinks. Ninth, enhancing the capacity of adaptation to climate change. China will attach great importance to capability building in addressing extreme climate events, and enhancing the capacity to respond to climate change in the key fields of farming, forestry, water resources and public health, as well as in the coastal and eco-fragile areas. It will study and formulate policies and measures allowing agriculture and forestry to respond to climate change, and guaranteeing food and ecological safety. It will rationally tap and optimize the allocation of water resources, and strengthen various water-saving policies and measures. It will enhance monitoring and protection of marine and coastal ecosystems, and increase the coastal areas' capacity to resist marine disasters. It will improve the emergency-response system, starting mechanism and multi-disaster early warning mechanism to tackle extreme meteorological disasters. Tenth, continuously strengthening capacity building. China will establish a basic statistical system for monitoring greenhouse gas emissions, and intensify statistical work on renewable resources, and resource supply and consumption. It will strengthen scientific and technological support, promote independent R&D of key low-carbon technologies, and expand low-carbon technology demonstration and popularization. It will further improve systems and mechanisms conducive to the development of human resources to cope with climate change, and constantly improve their quality. It will also extensively publicize knowledge necessary to respond to climate change and advocate low-carbon consumption through the mass media. Eleventh, carrying out all-directional international cooperation on climate change. China will continue to strengthen dialogues and exchanges with developed countries, initiate South-South cooperation on climate change in an all-round way, conduct capacity building and training in response to climate change, carry out technological cooperation programs to adapt to climate change, and organize energy-saving and water-saving activities as well as publicize and give out new-energy products and facilities. It will provide practical support to other developing countries in coping with climate change, and gradually build up a comprehensive system of foreign exchanges and cooperation under the guidance of a general plan, with the support of special funds and a contingent of professionals and with effective coverage of mitigation of and adaptation to climate change, as well as technology transfer and capacity building in addressing climate change. In 2011, the Chinese government released the Comprehensive Work Plan for Energy Conservation and Emission Reduction during the 12th Five-Year Plan period and the Work Plan for Greenhouse Gas Emission Control during the 12th Five-Year Plan period, making an overall arrangement for energy conservation, emission reduction and greenhouse gas emission control during that period. China has taken an active part in international climate change negotiations, playing a constructive role. It insists on the double-track negotiation mechanism of the UNFCCC and the Kyoto Protocol and upholds the principle of "common but differentiated responsibilities" in promoting the progress of international climate change negotiations. A UN climate change conference is scheduled for late November to early December 2011 in the South African city of Durban. China maintains that the Durban climate change conference should put into effect the consensus reached at the 2010 Cancun Climate Change Conference, determine the arrangements of relevant mechanisms, continue with the negotiations on issues left unresolved at the Cancun Conference, and strive for positive results on the basis of consensus already reached. First, China upholds the basic framework of the UNFCCC and Kyoto Protocol, and strictly follows the Bali Road Map. The UNFCCC and Kyoto Protocol are the basic framework and legal foundation of international cooperation for addressing climate change. They represent the international consensus reached as well as the basis and guide to action in implementing the Bali Road Map. The Bali Road Map requires that the UNFCCC and Kyoto Protocol are comprehensively, effectively and continuously implemented, and the developed countries should undertake to achieve substantial emission reduction targets for the second commitment period under the Kyoto Protocol, and corresponding arrangements are made regarding mitigation of and adaption to climate change, as well as technology transfer and funding in this regard. Second, China sticks to the principle of "common but differentiated responsibilities." Developed countries should be responsible for their accumulative emissions during their 200-odd years of industrialization, which is the main reason for the current global warming, and they should naturally take the lead in shouldering the historical responsibilities to substantially reduce emissions. With regard to capabilities, developed countries have substantial economic strength and advanced low-carbon technologies, while developing countries lack the financial strength and technologies to address climate change, and face multiple arduous tasks of developing their economies, fighting poverty and addressing climate change. Therefore, developed countries should, on the one hand, take the lead in reducing emissions substantially, and, on the other, provide financial support and transfer technologies to developing countries. The developing countries, while developing their economies and fighting poverty, should actively adopt measures to adapt to and mitigate climate change in accordance with their actual situations. Third, China holds fast to the principle of sustainable development. The present development should not compromise the development capacity of future generations. Instead, it is necessary to take into overall consideration economic development, poverty alleviation and climate protection within the framework of sustainable development, actively promote green and low-carbon development, and strive for a win-win situation in both socio-economic development and response to climate change. Fourth, China upholds a packaged arrangement of mitigation of and adaption to climate change, and fund and technology supply. Mitigating and adapting to climate change are two integral components in addressing climate change, and they should be accorded with equal attention. Mitigation of climate change is a long and arduous challenge, while adaptation to it is a more present and imminent task for developing countries. Funding and technologies are essential for the realization of mitigation of and adaptation to climate change, and financial support, technology transfer and capacity building support provided by developed countries are the fundamental guarantees for developing countries to effectively cope with climate change. Fifth, China upholds the principle that the United Nations leads climate change negotiations as well as the decision-making mechanism of reaching unanimity through consultation. China does not object to informal or small-scale consultations on urgent issues outside the negotiations on the UNFCCC and Kyoto Protocol which are conducive to the negotiation progress, but these consultations should be supplements to rather than substitutes for the negotiation process of the UNFCCC and Kyoto Protocol. The principle of "reaching unanimity through consultation" is an important part of the spirit of the UN Charter. It conforms to the general and long-term interests of the United Nations, and plays a significant role in strengthening democracy, authority and legality of decision making. Therefore, it is imperative to uphold the decision-making mechanism of "reaching unanimity through consultation," and raise work efficiency through appropriate means under the premise of guaranteeing an open and transparent negotiation process with wide participation. First, clarifying absolute quantities for developed countries' substantial emission reduction in the second commitment period under the Kyoto Protocol. The Kyoto Protocol, the first commitment period of which is due to expire by the end of 2012, is one of the double tracks of Bali Road Map negotiation mechanism. The emission-reduction plan for developed countries in the second commitment period under the Kyoto Protocol should be made clear as soon as possible so as not to leave a space between the two commitment periods under the Kyoto Protocol, as is required by the Cancun Accord. This task, the most urgent at Durban, is vital to the conference's success. Second, defining the emission reduction commitment under the UNFCCC for developed countries outside the protocol, which should be comparable with that of developed countries inside the protocol. Since developed countries inside the Kyoto Protocol have assumed their shares of emission reduction, developed countries outside the protocol should also assume comparable emission reduction commitments under the UNFCCC, in accordance with the Bali Road Map. The commitment should be comparable in terms of the nature and scope of emission reduction, and the compliance mechanism. In such circumstances, developing countries should also actively reduce their emissions within the framework of sustainable development with funds and technological support from developed countries. Many developing countries have put forward their climate change mitigation plans by 2020. In accordance with the principle of "common but differentiated responsibilities," after developed countries assume their law-binding emission reduction targets under the UNFCCC and the second commitment period of the Kyoto Protocol, developing countries' similar targets should also be clarified in the form of law, and their efforts for emission reduction should also be recognized. Third, specifying mechanisms and arrangements for adaptation, funding, technological transfer and capacity building, as well as measures to make the differences of emission reduction responsibilities transparent, measurable, reportable and verifiable between developed and developing countries. Most developing countries have taken active measures within their capacity to cope with climate change, and made important contributions. However, the international community still needs to provide effective support in funds and technological transfer to developing countries. The latter will not be able to effectively carry out actions to mitigate and adapt to climate change without an effective mechanism, new, additional and abundant funds or technological transfer. The Cancun Accord specified the "measurable, reportable and verifiable" mechanisms and the principle of transparency. China maintains that specific arrangements should be made at the Durban conference regarding developed countries' emission reduction commitments, their support to developing countries in funds, technological transfer and capacity building, various "measurable, reportable and verifiable" responsibilities between developing and developed countries, as well as "international negotiation and analysis" of developing countries' voluntary climate change mitigation. The arrangements should also fully embody the principle of "common but differentiated responsibilities" between developing and developed countries. China is clearly aware of the challenges brought about by climate change while advancing its modernization and urbanization. As a responsible and major developing country, China will take into account its basic national conditions and development stage, unswervingly adhere to the path of sustainable development, and make greater contributions to the cause of addressing global climate change. China will continue to promote international negotiations on climate change, take an active part in UN climate change conferences, and support the coming Durban climate change conference to achieve comprehensive and balanced results in implementing the Bali Road Map, and make reasonable, fair and effective arrangements for the full, effective and continuous implementation of the UNFCCC and Kyoto Protocol. China is willing to work with the international community to ensure the success of the Durban conference.